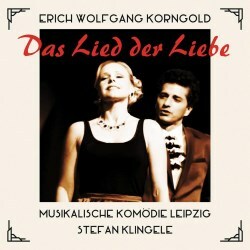 I was looking forward to hearing this world premiere recording of the operetta Das Lied der Liebe. Sadly it has not lived up to my expectations. The work is a curious hybrid. The disc names only Erich Wolfgang Korngold as the composer but in effect it is a work by Korngold based on themes by Johann Strauss the younger. Korngold had acted as arranger of other operettas through the 1920s but in this case he completely reworked an existing work – Das Spitzentuch der Königen – interpolating original music as well as other Strauss melodies and thereby creating a completely new work. No-one doubts that Korngold had a deep affinity for the genre and in turn was a master orchestrator but this does end up sounding like an unconvincing hotch-potch. For some reason I cannot quite explain, I find hearing tunes from The Blue Danube or Tales from the Vienna Woods set with lyrics jarring. The recording is performed by soloists and orchestra of the Musikalischen Komöde Leipzig under conductor Stefan Klingele. This is a group who specialise in operetta but the results are strangely stiff and unsmiling. The young cast have adequate but not very appealing voices. Tenor Adam Sanchez (in the Richard Tauber role) has all the notes but little of the lyrical warmth or freedom of that great singer. Lead soprano Lilli Wünscher has a rather disturbingly wide vibrato and a rather worn-sounding voice for one who looks quite young. The secondary leads have much more appealing and characterful voices. As presented here, there is no chorus or ensemble music aside from duets between the principals. This an exceptionally generous CD, recorded in standard stereo, runs to over 81 minutes of music on a single disc. The producers have got around the issue of the extended dialogue by using a narrator who explains the various intricacies of the convoluted plot. The cast speak as well as sing in the scenes where dialogue merge into song and vice versa. A significant problem for non-German speakers such as myself is that no libretto is supplied and the synopsis is as short as it is unclear. The ending of the work as described by the synopsis seems to leave everything hanging in a way that I cannot imagine it does in performance. Two other factors rather work against this recording;. The playing of the Leipzig orchestra is good but the actual sound is rather close and unforgiving. Additionally the church acoustic gives the bass drum in particular far too much presence. The result of this is a rather hard and austere bed of orchestral sound. In effect, even when Korngold apes Lehar in the work's most famous song Du bist mein Traum, the collective sound of the orchestra is edgy rather than warm, and every eye stays bleakly dry. Korngold tries to update the "Golden Age" melodies by adding a saxophone and giving some melodies 1920s dance rhythms but again Klingele seems determined to avoid any kind of sentiment or freedom in the playing or singing. Perhaps this was conscious decision to 'post-modernise' the performance and avoid any accusation of Tauber-esque schmaltz. If so, that was the wrong decision. For a group claiming particular affinity with this genre this is bafflingly unidiomatic and unsympathetic. I must admit I have a real soft spot for operetta in general and the music of Korngold in particular, so my disappointment in this release is substantial. One for the completists only.